I’m pizza lover. I hail from that sacred strip of the universe east of the Delaware dubbed the “Pizza Belt,” and by far more worthy pizza aficionados than I.
I consider Ed Levine’s book, Pizza: A Slice of Heaven: The Ultimate Pizza Guide and Companion, to be a work of great culinary literature. And so when I learned that I am gluten intolerant (I’ll spare you the details), it came as a shock that I would no longer be able to enjoy “real” pizza. And believe me, if you are from east of the Delaware, you know what that did to me. No more late-night pizzerias. No more tugging on perfect crust or lapping up long, hot strands of mozerella. Those days are gone. really is quite nice of them to do so. However, they’ve been tried and found wanting. I think it’s the fact that they used refined rice flour, along with the usual potato starch, that gives their crusts a paste-board texture. Since I can’t have the real stuff, at least without feeling like there’s a brick in my gut all night, I decided to just fahgedaboudit. But then the taste for pizza comes creeping back when I least expect it. Especially in the check-out line at the natural food store, when I see my old friend Tomato Pie splashed across a magazine cover. The first cauliflower crust I tried wasn’t a failure, but didn’t hit the mark. Problem was, you couldn’t “fold” the pizza slice in your hand. I am sorry, but I need to be able to hold the thing while I eat it. I don’t want to eat it with a fork. That is why I adapted the recipe by adding both potato flour and brown rice flour. Now the crust has a nice “bend” to it when I pick it up. The texture is even better the next day. But don’t take my word for it. Get to work! Make pizza! Mozzerella, sliced bell pepper, onion, olives, mushrooms – whatever you like. (Remember to slightly undercook any meat in a skillet beforehand. We like tiny balls of organic sausage. The meat will finish cooking in the oven.) Remember to drain liquid from toppings, or the crust may turn out soggy. Preheat oven to 425⁰ F.
Wash and drain a medium head of cauliflower separated into flowerettes. Use food processor to shred until rice-like. I compare the texture to lecithin granules. Use a clean, loose-weave dish cloth, or several squares of cheese cloth, to drain out most of excess liquid. I don’t make mine completely dry. Put the drained cauliflower into a medium bowl. 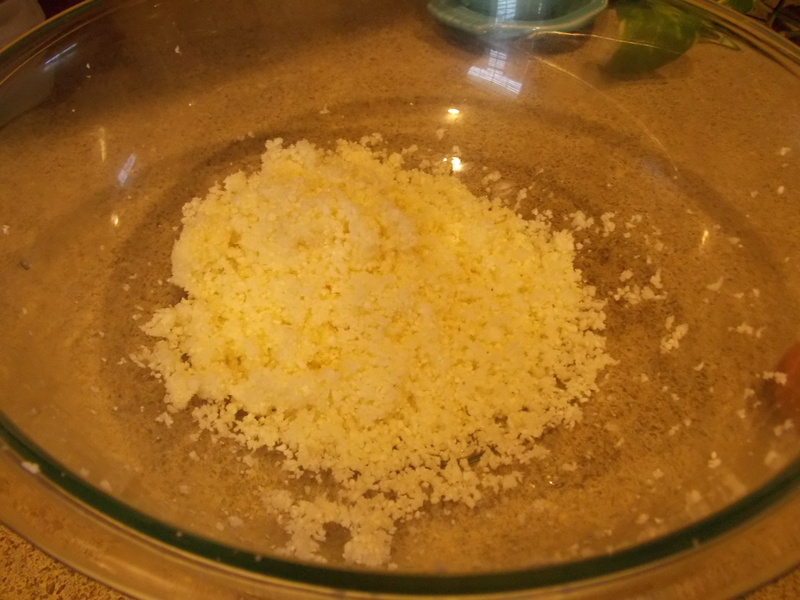 Stir in parmesan cheese and egg. 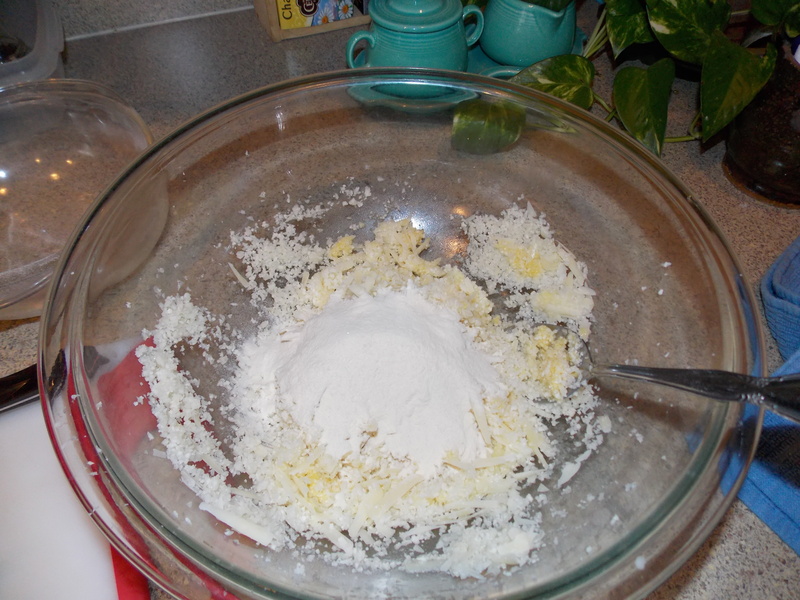 Combine xanthan gum, salt, baking powder and flours in separate small bowl. Add to wet ingredients and mix well. Pull the mass into a ball with your hands. Prepare a cookie sheet with a small amount of olive oil – just enough to lubricate the bottom. 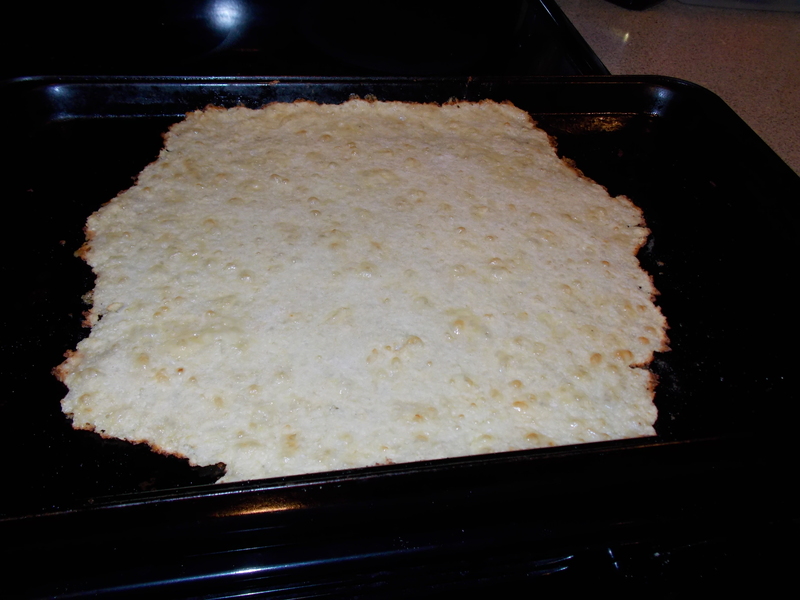 Using hands, start flattening the dough and spread across the cookie sheet. I like start out using a rolling pin without a handle. Go easy! This dough will require “finessing.” You will need to stretch it by wetting your hands and flattening with palms or fingers. (Xanthan gum lends a slightly slimy, spreadable quality that will allow you to do this.) I can get the dough to cover an entire cookie sheet. 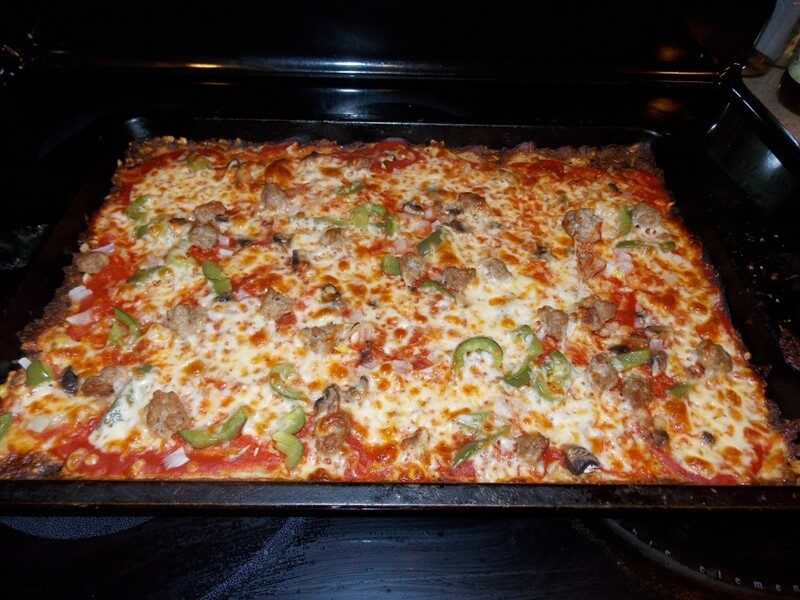 Prebake crust for 7-10 minutes. Tiny brown bubbles will appear on surface. Edges should be slightly brown. Don’t over-bake! Lower oven temp to 400⁰ F. Return to oven for 15-18 minutes. 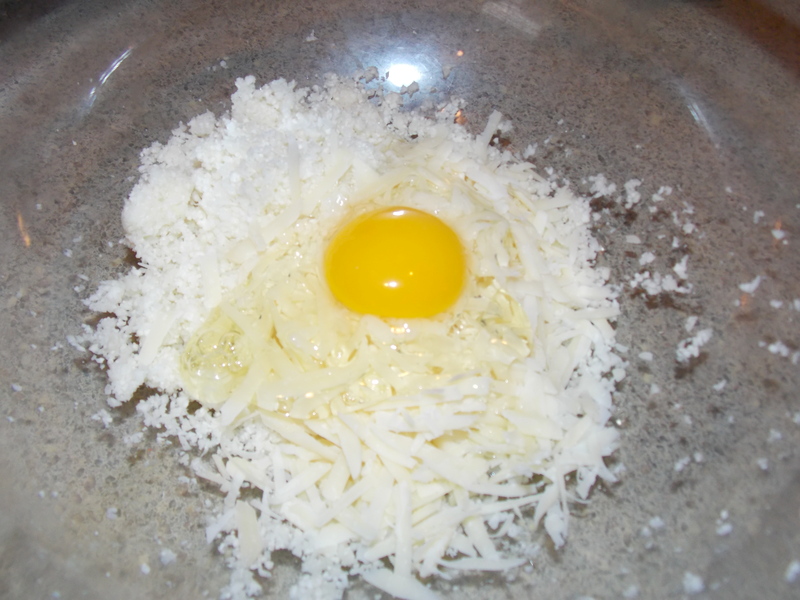 Add fresh grated parmesan cheese and egg. I’ve tested the crust recipe three times now. It actually seems to hold together pretty well. Even better when it’s cool. Do not expect the “tooth” of regular pizza crust, the kind you knead and let rise. That requires wheat flour, which has gluten.